Having lived in the Southeast for most of my life, I find it a bit dishonest to say that there is a defined “severe weather season” for this region. We, after all, are the ones who rang in the new year with a tornado outbreak. We’ve had tornadoes a couple days before Christmas, in January, during hurricanes, and occasionally even during the summer months. We have certainly had powerful thunderstorms in the summer months that have brought extreme wind, hail, and lightning. However, it is fair to say that there are periods of the year when the most destructive types of severe weather are more common than others, and perhaps these are what should be defined as the “severe weather seasons” for the South. If this is the case, then we are entering the spring severe weather season. We’ve already had a taste of it when the powerful squall line came through last week on Thursday and Friday, generating several tornadoes and 100-mile-an-hour winds in Tennessee. That, however, was just a teaser, and an event is currently in the process of unfolding that promises to be more significant. Tonight’s event has a couple of parameters in place that last week’s did not, at least not to a great extent, plus all the parameters that last week’s event did have. I am using images from the RUC model, which is a short-range model containing live observations that is run every hour. First of all, there is a strong jet over the region. This jet will have uplift occurring on its northeast side. Since it is a 120-knot jet, this will provide significant uplift. 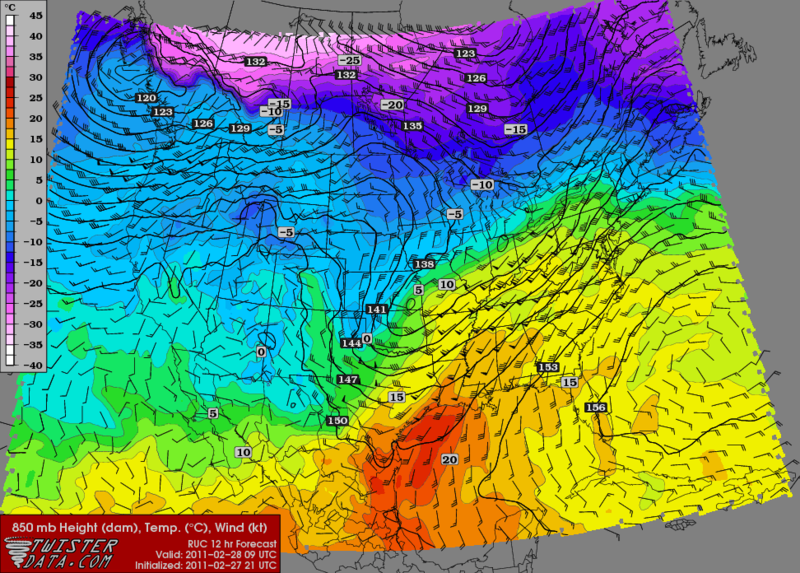 Secondly, there is a decent thermal gradient and fairly strong winds at the 850 mb level. This will provide fuel to the strengthening low pressure center that is the source of the upcoming bad weather. The advection of warm air is also a source of uplift. There is also an area of vorticity (essentially, rotational motion of wind). Vorticity is not the source of tornadoes, despite the suggestive name; in fact, uplift associated with vorticity is not directly under the strongest area, but is instead downstream of it. The vorticity is being advected in that direction by the motion of the air. Incidentally, that accounts for three parameters providing favorable severe weather conditions over pretty much the same spot: Memphis/St. Louis/NE Arkansas. Now, the parameters that last week’s event did not have in place relate specifically to supercell formation. Last week’s event had plenty of uplift and wind shear, just not a lot of atmospheric instability and helicity. Tonight’s expected outbreak is a different story. There are values approaching 2000 J/kg expected over, yes, the same area where a lot of uplift is supposed to be occurring. This isn’t a stupendous value, but it’s pretty significant for an early-season outbreak. Some of the highest values of CAPE I’ve ever heard of were on the order of 6000 J/kg for events that produced F5 tornadoes. Where other favorable parameters exist, CAPE is directly correlated with the formation of thunderstorms. The peak swath of high helicity is a little off-center compared to the rest of the favorable parameters, but a pretty significant area of it is nonetheless centered right over the area in the lower Midwest/upper South where the rest of the favorable parameters are converging. I am expecting a tornado outbreak over this area tonight, pushing eastward into Tennessee in the early morning hours. This is not good, as nighttime tornadoes are easily the deadliest of all. 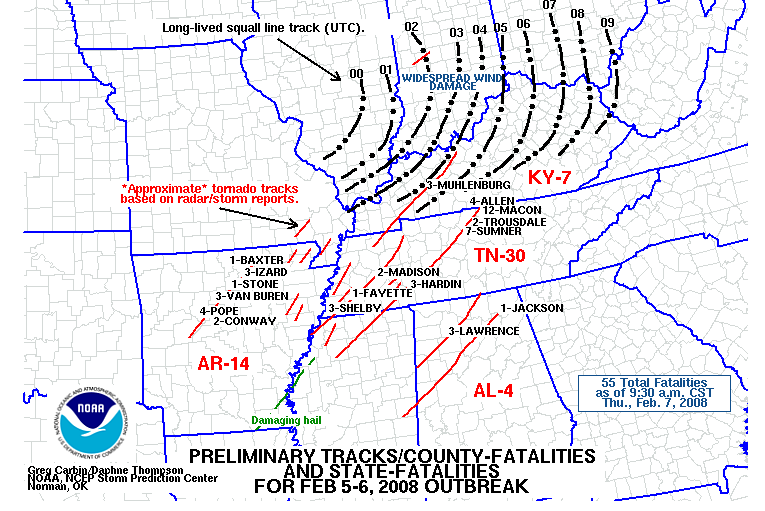 (See my previous blog entry about the tornado outbreak of February 5, 2008 for more about Southern tornadoes.) I completely agree with the Storm Prediction Center’s decision to issue a moderate risk for this region tonight and tomorrow. I think it is possible that tornadoes may occur a bit farther south than currently indicated, mainly because of that high helicity index, but I am not expecting there to be a very great threat much south of Highway 82. At the moment, Arkansas is apparently under a blanket of snow in many areas, and more cold weather and possible winter precipitation is apparently expected. This is interesting to me because at this time not too long ago, Arkansas was essentially “ground zero” for an entirely different kind of destructive meteorological phenomenon, which had also occurred in a La Nina winter. Three years ago, a violent, extensive tornado outbreak began in the South and lower Midwest. Because the outbreak began on “Super Tuesday,” the day when the largest number of state presidential primaries were held, the outbreak was dubbed the Super Tuesday Outbreak. It left in its wake 87 confirmed tornadoes, which killed 57 people—a death toll unheard of for almost 25 years. The system that produced the outbreak, a low pressure center with a deep warm sector and powerful trailing cold front, moved from Texas to Missouri during the outbreak. Upper-level jets provided decent support, with a jet approaching 120 knots located over eastern Kansas, Arkansas, Missouri, and Oklahoma. 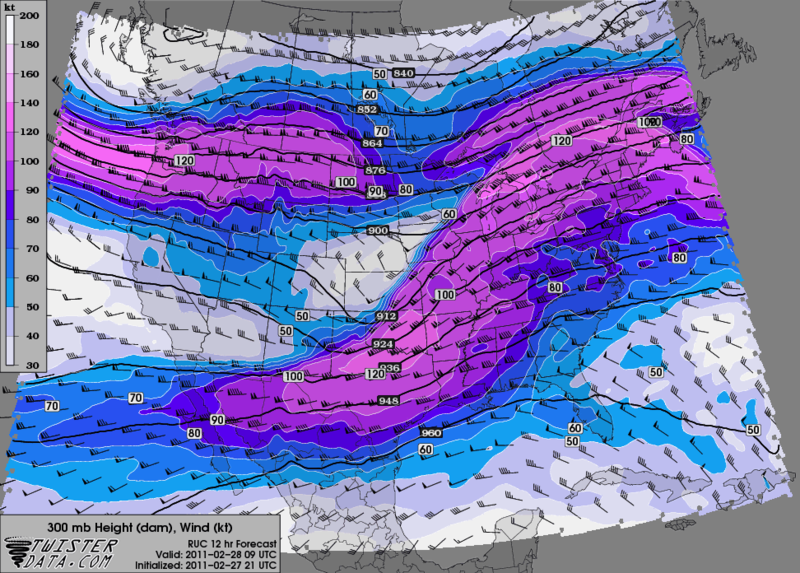 Instability was sufficient to promote severe weather in the form of supercells, with 1000 J/kg of CAPE observed. This is not particularly spectacular for the usual tornado season, but it is not often found in cold-season outbreaks. High shear as a result of the jet further fueled the outbreak. The tornadoes occurred on the east side of the cyclone, as is usually the case. Though it was not as intense as the Super Outbreak of 1974 that produced either 6 or 7 F5 tornadoes (depending on what source you believe), this outbreak was typical of large-scale tornadic outbreaks in that it produced a lot of violent and strong twisters, which normally occur in comparative isolation. In this outbreak, five EF4 tornadoes were observed, including a long-tracked tornado in Arkansas that had a path length of over 120 miles. This tornado alone was responsible for 13 of the fatalities. Another long-tracked tornado, this one an EF3 in Tennessee with a 51-mile path, was responsible for 22 deaths. This relates intimately to a point that I have been making for several years, and what I think is the principal lesson of this outbreak and its calamitous death toll (for modern times). The South, particularly AR, LA, MS, TN, and AL, is subject to far more violent long-tracked tornadoes than any other region of the country. I mean it isn’t even close. Here is a PDF of a paper by two professional meteorologists about the statistical patterns indicating the real “tornado alley,” at least as far as F3-F5 long-tracked tornadoes are concerned. If you are frightened of statistics, this is a graphic from Jackson, MS that puts up the raw data, the paths of all long-tracked tornadoes rated 4 or 5. It’s not exactly the same data being looked at in the graphic and the paper, but nonetheless, the point that is coming through loud and clear is that the Deep South is the primary breeding ground for the most dangerous, destructive, and deadly kinds of tornadoes that the atmosphere can produce: strong-to-violent long-tracked twisters. Furthermore, the South is more prone than any other region of the country to have substandard housing that is particularly vulnerable to tornadoes. There is no reason for anyone in a house to die in a weak tornado (an EF0 or EF1), but it still happens, and poor construction or deterioration is to blame for a lot of it. Mobile homes do not help the problem, and it is sickening to me (I guess I still have fragments of a social activist in me) that one’s survival in a tornado, in the United States in the 21st century, could depend on one’s financial status, but this is how it is. Also, most buildings in the South do not have tornado shelters. Even large venues in the South often have no severe weather plan. I’m going to pick on one, the Georgia Dome, which was brushed by an EF2 tornado while a basketball game was going on later in 2008. There was little official word given to the spectators about what was happening until the tornado was actually upon them, making the ceiling shake! There is an infamous YouTube video from inside the stadium as the tornado was passing by, so you can see for yourself what I mean. The only reason that didn’t result in a major disaster was that the game went into overtime, keeping the fans inside the stadium. And finally, unlike the other parts of Tornado Alley (“Dixie Alley” and “Hoosier Alley,” the South and Midwest respectively, are not really separate from Plains Alley), the South does not, in many locations, have an effective local warning system. I don’t mean the issuance of warnings. The weather office in Jackson is very effective at producing warnings. If anything, they overwarn! There is not a problem with the warnings being generated. The problem, rather, is with dissemination to the public during times when the public is most likely not able to know what is going on. Some areas are better than others at issuing tornado alarms. I can think of one time when Oktibbeha County, Mississippi sounded its alarms for apparently the whole county when the tornado in question was on a far corner and headed out. This is how it happens more often than not when a county has tornado sirens. This kind of thing, in my opinion, is overwarning, and it can lead to complacency, but it is preferable to the alternative. I witnessed that on the New Year’s Eve 2010/2011 tornado outbreak when a very strongly rotating supercell entered Noxubee County, MS around 2:00 AM. It was quickly warned by the National Weather Service. However, the county did not sound its alarms until the tornado was actually on the Mississippi/Alabama border! It was an EF3 tornado, and by that time, it had already done its damage in the rural part of the county. I’ll repeat this: 2:25 in the morning on New Year’s Day, and the tornado alarm was not sounded until the tornado had already passed. This is inexcusable. It is fortunate that no one was killed. Some other areas do not have tornado alarms at all. The major problem in the South, which contributes to the higher death tolls from tornadoes in the South than in any other region of the country (including the other two parts of Tornado Alley), is that of public awareness. However, in general I do not mean awareness of the event as it is ongoing. Unless it is a nighttime event or is occurring when people are likely to be occupied with something else (such as watching a basketball game or being drunk, as the case may be), I think most people are aware if there is a tornado warning for their county. The local media are still the primary source of people’s information about weather warnings (most people are not plugged into the Internet 24/7, and as horrifying as it may seem to some of you, most of the South is still on dial-up). Most TV stations here interrupt regular programming to provide information. WCBI in the Golden Triangle region of Mississippi is good at providing detailed information about what is happening (though, in my opinion, there is a slight urban bias in what events warrant cuts in programming). When I say that there is a public awareness problem, it is referring more to long-term awareness. Awareness of the risk, which (as the paper and the graphic I linked above indicate) is much higher than they seem to realize. This is the sort of awareness that might lead people to build a tornado shelter underground, designate a specific room in the house to be shored up (which, if done properly, generally provides shelter against up to EF4 winds), and have a plan. The affordability of shelter is a separate problem, and it is one that, as I said, positively sickens me. Back in the day, after the F5 tornado of May 3, 1999 that hit near Oklahoma City, there was a government rebate for people who purchased tornado shelters. It’s difficult in this day and age to make the case that the government should spend money on ordinary people, it seems, but it really wouldn’t hurt that much for it to at least be a tax write-off. The Super Tuesday Outbreak demonstrated that, even in the modern era of NEXRAD, real-time weather forecasts, high-speed Internet, cell phones, and PDAs, a tornado outbreak lasting essentially a day and a half can still kill over 50 people. A single tornado, one that was not even rated “violent,” can kill over 20 people. Meteorologists for several years have been saying that there is a tornado awareness problem in the South, which is manifest in public complacency, poor shelter options, and ineffective tornado siren policies. Given that the Deep South is, quite clearly, the bull’s eye for the worst kind of tornado that the atmosphere can produce—long-tracked violent ones—this state of affairs is unacceptable. The Super Tuesday Outbreak will be repeated at some point—if not in the exact same geographical location in the South, then somewhere else in the region, and it will have an aftermath that is the same or worse unless something is done about the problem.